Kellogg Community College is offering a variety of classes and one session of Nursing Assistant (CNA) Training at the College’s Fehsenfeld Center campus in Hastings this summer. For a complete list of Summer 2017 semester classes offered at KCC’s Fehsenfeld Center and other campus locations, visit www.kellogg.edu and click on “Class Schedules” in the top menu to search for sections. Summer 2017 classes begin May 15 and the semester ends Aug. 7. For information about signing up for summer classes, visit www.kellogg.edu/registration. For more information about KCC’s Fehsenfeld Center campus in Hastings, visit www.kellogg.edu/fehsenfeld. 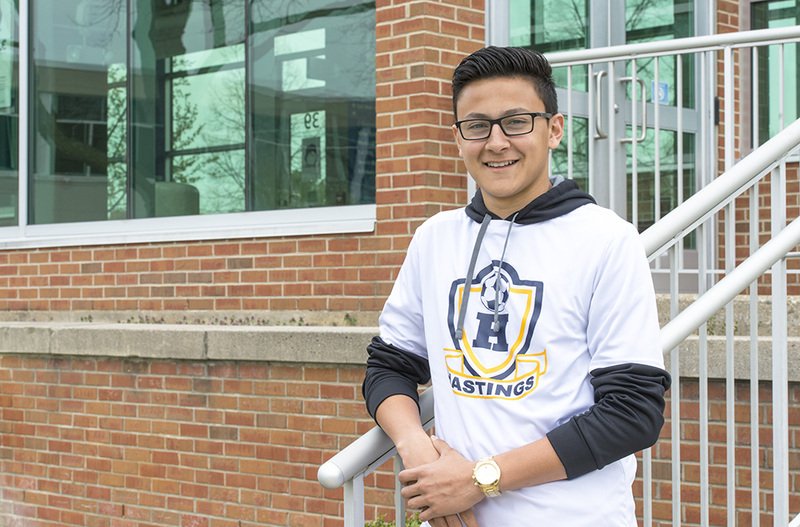 Pictured above, former dual-enrolled KCC student and Hastings High School graduate Andres Carmona poses outside the main entrance on KCC’s North Avenue campus in Battle Creek. Click here to read more of Carmona’s KCC story.